Sigma-Aldrich is a leading Life Science and High Technology company. Its biochemical and organic chemical products and kits are used in scientific research, including genomic and proteomic research, biotechnology, pharmaceutical development and as key components in pharmaceutical, diagnostic and other high technology manufacturing. Sigma-Aldrich has customers in life science companies, university and government institutions, hospitals, and in industry. Over one million scientists and technologists use its products. Sigma-Aldrich operates in 38 countries and has 7,700 employees providing excellent service worldwide. Sigma-Aldrich is committed to Accelerating Customer Success through Innovation and Leadership in Life Science, High Technology and Service. Greyhound Chromatography is delighted to represent Sigma Aldrich in the UK. 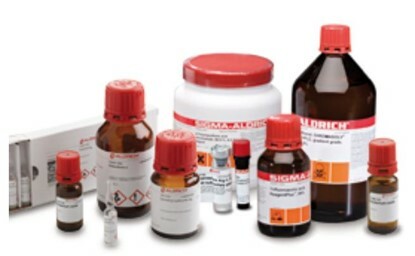 With access to over 270,000 products Sigma Aldrich provides laboratory solutions for many scientific areas. Visit our Home Page at www.greyhoundchrom.com to access the Sigma search facility. For over 30 years Greyhound Chromatography has been supplying high quality Chromatography consumables to laboratories around the world. Greyhound’s extensive range covers all areas of Environmental, Petrochemical, Food, Forensics, Chemical and Pharmaceutical analysis. Backed by a highly experienced technical services team, Greyhound is the preferred source amongst today’s analysts.